At this price why not repurpose for holiday candy?! 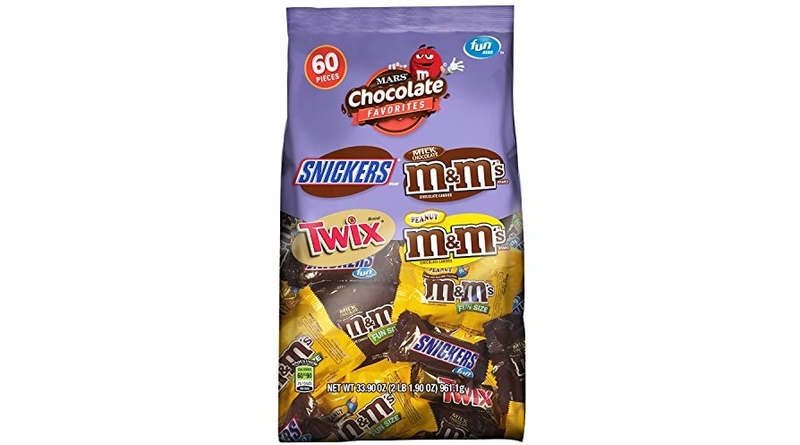 😀 Amazon is offering the lowest price to date on MARS Chocolate Favorites Fun Size Halloween Candy Bars Variety Mix 33.9-Ounce 60-Piece Bag for $9.94 (reg. $19.95). Save up to an extra 15% off when you checkout via the Subscribe & Save option making the price as low as $8.45 shipped! There’s something for everyone to enjoy with the MARS Chocolate Favorites Fun Size Candy Bars Variety Mix. This bag contains an assortment of M&M’S Milk Chocolate Candy, M&M’S Peanut Chocolate Candy, TWIX Cookie Bars and SNICKERS Candy Bars. Each bag contains 60 pieces so there is plenty to share. Stock up on a few bags to be ready for trick-or-treaters on Halloween night. Each candy bar is individually wrapped, making them easy to hand out to the little super heroes and princesses who come trick-or-treating in your neighborhood.